Drumlemble Village Situated on the road which runs West out of Campbeltown, and closer to Machrihanish than the town, lies the small village of Drumlemble. Home to no more than a few hundred people, it sits at the very end of a two mile section of straight, flat road - unusual in this part of the world. This straight has been used over the years as a proving ground for many local vehicles, in fact on the day that I went out to take these pictures an unmarked police car, fitted with radar detection equipment, was circling around, waiting for a victim to come along! Once the road passes through the village it takes a sharp turn to the right - a bend in the road that's caught out a number of motorists over the years. This picture shows the main road through Drumlemble and on the left, miner's houses - a site far more common in the Central Belt of Scotland where coal mining was a major industry, but unusual in this part of the world. Drumlemble was once the main centre of coal mining activities in Kintyre. Records as far back as 1498 show an awareness of the coal deposits in the area, and around the end of the 17th century it is known that the mine steadily employed a number of local people. In 1794 a canal was opened to ease the flow of coal from the mine into Campbeltown, the last traces of which can still be seen from various points alongside the main road even to this day. This mode of transport eventually became overgrown and outmoded, and in 1877 a new light railway was opened. You can see a picture of it on the Machrihanish page. 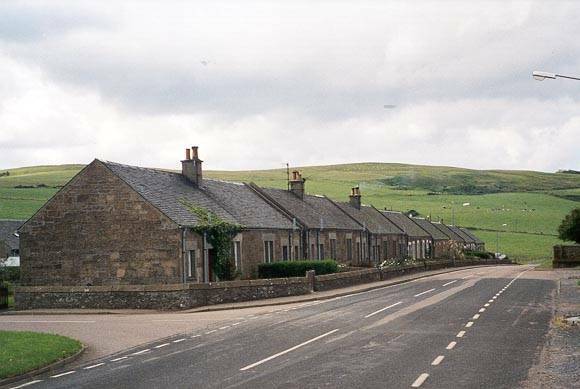 This picture was taken from behind the village looking North - the main Campbeltown to Machrihanish road runs right to left. In the distance, just left of centre can be seen a range of hills which are actually the "Paps of Jura" on the island of Jura. 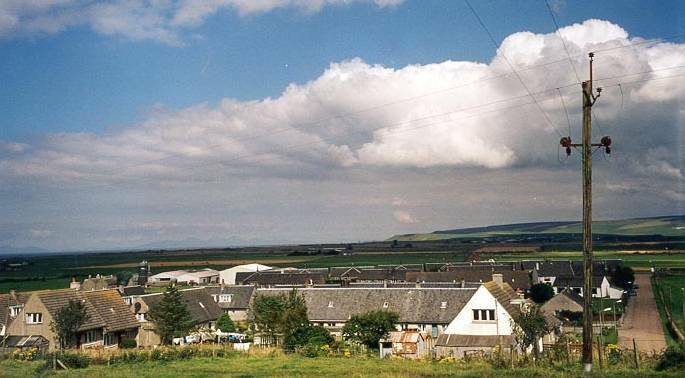 The flat ground which lies between Drumlemble and, at the far end, Westport, is known as The Laggan, and is the site of RAF Machrihanish, although you'd barely know it from this picture. As you can see the majority of the dwelling houses within Drumlemble are of a more modern nature than the miner's houses at the front. Since this picture was taken more than ten years ago a wind farm is now visible on the furthest away hillside. 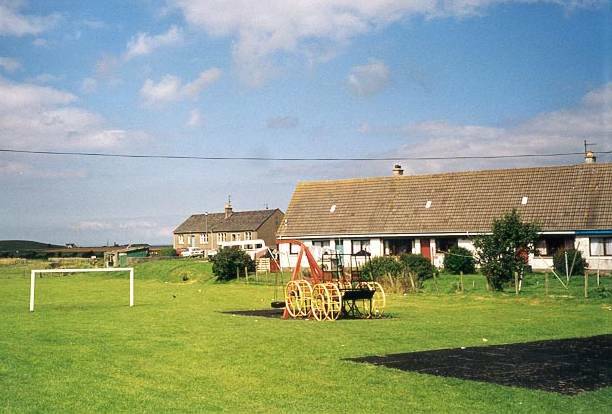 This picture shows the park in the centre of Drumlemble which looks as peaceful as any other similar park in the area. It was not long, however, since the remnants of the underground workings caused large holes to appear in the ground in this very spot. Considerable money was spent filling and making safe the old mine workings, and ensuring that the local houses weren't dangerously undermined. I'm lead to believe that Drumlemble School, which is about a half mile back along the road towards Campbeltown, was in common with other mining towns in the Central Belt, built at such a distance in order to be clear of any potential subterranean ground workings. 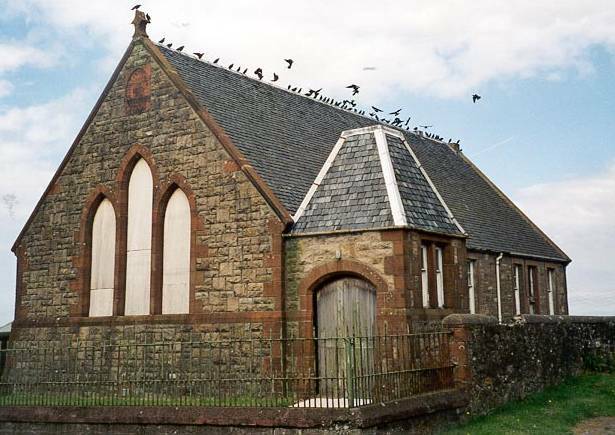 The initiative to put together this page on Drumlemble, when h it wasn't even in the original list of villages to cover in Kintyre, came about after I received an email from Scooter Muse of Alabama. His folk group called "Full Moon Ensemble" had just released their latest album "The Road to Drumleman", titled after the song of the same name. Drumleman was the old, traditional way of pronouncing Drumlemble, this particular song was written back in the 1940s by a local man Willie Mitchell. Willie was renowned as a singer and songwriter in the area, and was often seen cycling around the roads of Kintyre. As a small boy I'd occasionally meet up with him on the road around my home of Auchencorvie Farm, 'though his journeys always took him much farther than I was capable of in these days. I've included the picture of the village hall as it would be nice to think that some day the Full Moon Ensemble would manage a gig here! (Update 2010 - since this section was added, the Full Moon Ensemble have played at the local Music Festival, Scooter having made a number of appearances).